Notice anything missing? I didn’t, until I got to work yesterday. It was like that dream where you’re in a big crowd of people and you suddenly realize you’re wearing nothing but underwear. My coworkers were very understanding about it. All day long as I padded around the office I expected somebody to say something to me, but they never did. Nobody so much as smirked. Maybe it’s happened to them, too. 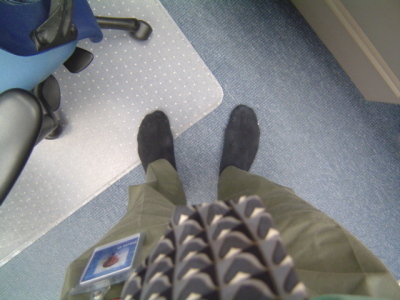 It’s not like I walked to work in my stocking feet, I’m quick to point out. I put on a pair of snow boots before I leave the house in the morning. Then, when I get to the office, I change into a pair of brown leather shoes that I usually keep under my desk. But, the day before yesterday, I took them home with me because I thought we’d need them for our dancing lesson. I didn’t. We danced in our stocking feet. It was sort of a foreshadowing of my day at the office yesterday.